Taiwanese manufacturer GWT has come up with the industry's first USB 3.1 Type C docking station, one that connects to the host computer with only one cable. The market for the DUD10B0 though is fairly limited as there's exactly one laptop and it is not even a Windows notebook. Many criticised Apple for cutting down the number of ports on the new MacBook to just one, a lonely USB 3.1 Type C connector. But just as the first MacBook Air was the precursor to the wave of Ultrabooks that ultimately brought the demise of the optical drive and Ethernet connectors on most laptops, Apple's latest laptop is likely to pave the way for USB-C laptops, like the recently released ChromeBook Pixel 2, which is not compatible with the DUD10B0. 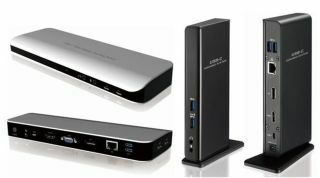 This, combined with the rising popularity of laptops as replacements for their desktop counterparts and the BYOD (bring your own device) phenomenon, explains why many vendors are unveiling docking station. The DUD10B0 come with an impressive array of connectors. A USB 3.1 Gen 1 connector that can provide up to 36W of power, four USB ports, two USB type C ports, Display Port, HDMI, VGA, Gigabit Ethernet and a couple of audio ports. GWT hasn't confirmed when the device would be launched in Europe and what would be the price.